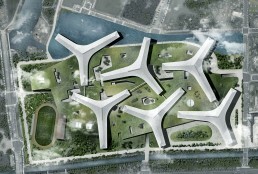 The concept originated from our interpretation of the landscape, and from there, was the basin for the entire project. 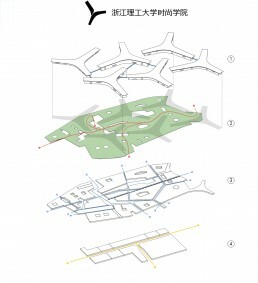 This is the strong idea of the entire University Campus design, based on the creation of a green park as a foundation for the whole complex; the landscape is the source of a new, natural, settlement, designed around the core of natural elements of the area: water (river, lakes, channels), small and undulating hills and native vegetation. The complex is counterpointed by a system of large courtyards and tree-lined squares as a center of socialization and open air activities of students. The new landscape is conceived as a mantle that covers and protects, at the ground floor, large areas destined to multiple activities. An equipped plate that contains the pedestrian path system (partly also mechanized with tapis-roulant) connecting all the various functions. Six buildings stand with lightness, almost suspended over the new landscape, as large trees with open foliage and are connected to each other through pedestrian bridges at various levels. All buildings, thanks to their shape, which recalls the Chinese ideogram “ro”, (person), take advantage of very open and multidirectional facades, both to the surrounding environment and to the large inner areas between one building and the others, as parts of a soft and natural public park.